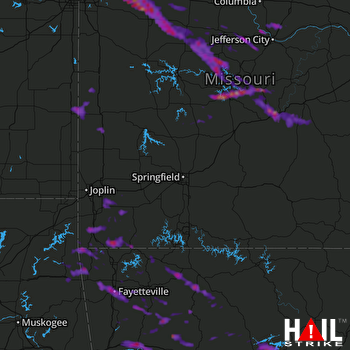 Doppler radar detected Quarter size hail near Grain Valley, MO, Harrisonville, MO and Oak Grove, MO on August 31, 2018. This hail storm was traveling E at 21 mph and the entire storm produced hail for roughly 5 hour(s). There were 1 spotter report(s) with reported max hail size of 1″ and an average hail size of 1″. We estimate that 35,178 buildings were in the affected area and the probability of hail DHI detected was significant. Based on this information, you can expect to see minor damage to vehicles, tile roofs and crops in isolated areas (Intensity Rating 2). 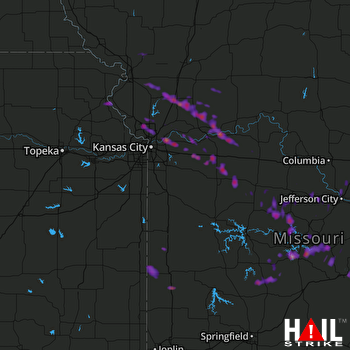 Doppler radar detected Quarter size hail near Warrensburg, MO, Atchison, KS and Holden, MO on August 31, 2018. This hail storm was traveling ENE at 21 mph and the entire storm produced hail for roughly 2 hour(s). There were 4 spotter report(s) with reported max hail size of 1.75″ and an average hail size of 1.15″. We estimate that 35,873 buildings were in the affected area and the probability of hail DHI detected was significant. Based on this information, you can expect to see minor damage to vehicles, tile roofs and crops in isolated areas (Intensity Rating 2). 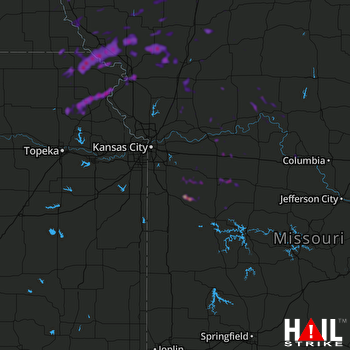 Doppler radar detected Half Dollar size hail near Kansas City, MO, Warrensburg, MO and Belton, MO on July 19, 2018. This hail storm was traveling SSE at 31 mph and the entire storm produced hail for roughly 3 hour(s). There were 19 spotter report(s) with reported max hail size of 2″ and an average hail size of 1.42″. We estimate that 92,818 buildings were in the affected area and the probability of hail DHI detected was significant. Based on this information, you can expect to find damaged crops, glass damage, automobile bodywork damage, as well as isolated roof damage (Intensity Rating 3). Doppler radar detected Half Dollar size hail near Camdenton, MO, Atchison, KS and Oak Grove, MO on August 18, 2017. This hail storm was traveling ESE at 32 mph and the entire storm produced hail for roughly 3 hour(s). There were 10 spotter report(s) with reported max hail size of 2″ and an average hail size of 1.38″. We estimate that 86,281 buildings were in the affected area and the probability of hail DHI detected was significant. Based on this information, you can expect to find damaged crops, glass damage, automobile bodywork damage, as well as isolated roof damage (Impact Rating 3). 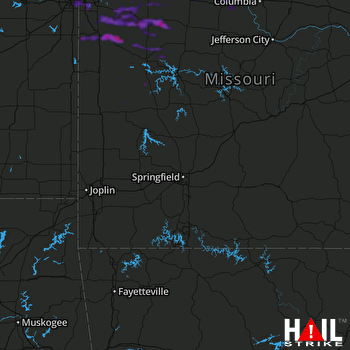 Doppler radar detected Half Dollar size hail near Independence, MO, Fayetteville, AR and Camdenton, MO on August 19, 2017. This hail storm was traveling SE at 32 mph and the entire storm produced hail for roughly 7 hour(s). There were 14 spotter report(s) with reported max hail size of 2″ and an average hail size of 1.35″. We estimate that 102,383 buildings were in the affected area and the probability of hail DHI detected was significant. Based on this information, you can expect to find damaged crops, glass damage, automobile bodywork damage, as well as isolated roof damage (Impact Rating 3).